I somehow still can’t believe that May is already upon us – even though it’s now May 4th. I guess I’d better get in the spirit before Cinco de Mayo rolls around! By the way – if you’re planning a cinco de mayo party, don’t forget about Pineapple Salsa, Mango Salsa, Authentic Mexican Chicken Tacos, and Pineapple Pork Tacos! We’re sorry we haven’t exactly been active bloggers lately – life seems crazier than ever. Gardner graduates from law school in less than 2 weeks! When life seems crazy I always find breakfast-for-dinner comforting – but I can’t explain why. I think eggs benedict for dinner is one of the most delicious concoctions ever. Now that you’re a egg-poaching pro (you made that salad, right?! 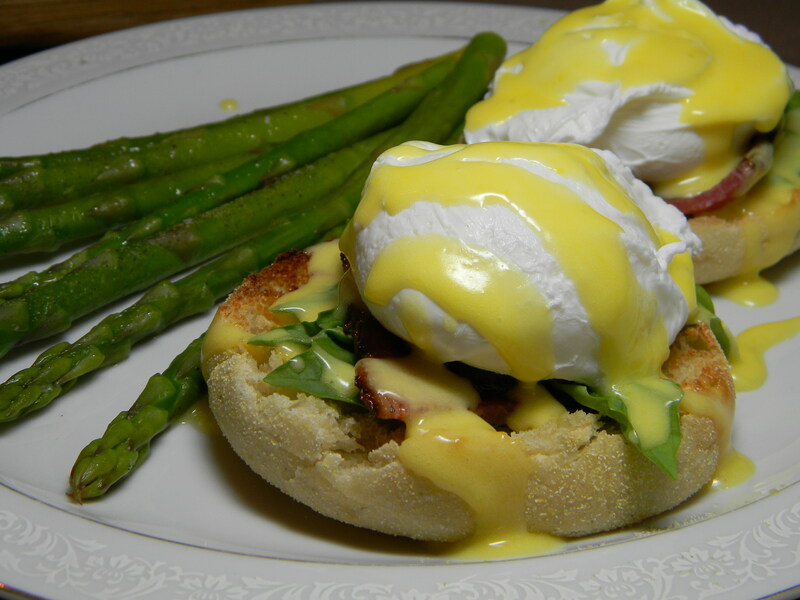 ), you need to try making eggs benedict. We used lamb bacon from the butchery, instead of canadian bacon or normal bacon – and it was extra delicious. Enjoy! WOW. This looks incredible!! Going to have to try! Great photo of eggs Benedict! I’ve never tried lamb bacon. I’ll have to look for it.